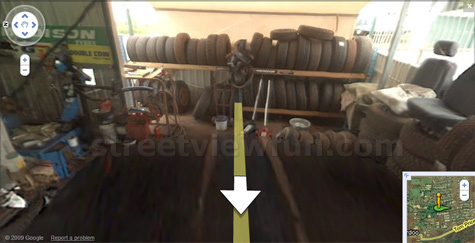 The Google Street View car got a flat tyre in Paraburdoo in Western Australia. The camera was on when it had to go to a local workshop to get repaired. Happy driver Street View car pulls over and driver steps out for a smoke Someone’s not happy with Google Streetview Another serious bug in Google StreetView! You left the camera on? ‘Tyre’ suits most of the world just fine. Note to America, there are other countries out there!